Treat yourself Tuesday has reached a whole new level! I recently discovered that Tuesday's flavor of the day at my favorite cupcakery, Coastal Cupcakes, is Cheesecake. Mike is a cheesecake connoisseur of sorts, so last Tuesday I scurried down to the Wrightsville Beach location right after work and just my luck, picked up the last two! The cupcake was just as I expected: phenomenal. 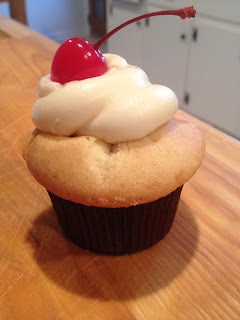 The creamy cheesecake filling and fluffy vanilla frosting left me wishing I had picked up two more! So this Tuesday, treat yourself to your favorite cupcake (check out the daily Coastal Cupcake specials here ). After all, you deserve it!